It's Monday, and about the only good thing is that this is the day of the Monday Movie Challenge Hop! On the last (or fourth) Monday of each month, a group of bloggers participate in a #MovieMondayChallenge, hosted by C'mon Get Crafty! We decide on a topic, genre, or specific movie to use for inspiration and everyone gets free reign to create something wonderful! This month's challenge was. . . . "Romance! Everyone was allowed to choose their own favorite romantic film for this challenge. I'm not really a Nicholas Sparks type of girl, but I do enjoy a good Rom-Com now and then. One of my favorites that I'll watch whenever it's on TV is Serendipity, starring Kate Beckinsale and John Cusack. They have a chance encounter at a store that leaves them wondering "what if" even though they are both in relationships with others. When all seems to conspire to keep them apart, lots of little "serendipity" events (or happy accidents) eventually help them realize they are right for each other, and bring them together at last. This is movie is so cute and so utterly ridiculous at the same time. It just makes me happy. If you haven't seen the movie, the main characters have a date at one of the iconic New York city treat shops, Serendipity 3. They share an amazing-looking frozen hot chocolate. There are about a million frozen hot chocolate recipes on the Internet, so rather than making my own version, I thought I'd incorporate the sweet treat in a printable you can display as part of your Valentine's Day decor. Working from home gives me the opportunity to do something else I love--volunteer in my sons' school! I help with math, reading, art projects, and anything else teachers need. One of the big jobs our volunteers have is trimming and counting Box Tops for Education. It is a repetitive, thankless job, but it is SO WORTH IT to earn that money for your school! The school gets 10 cents for every Box Top that is clipped and sent in. 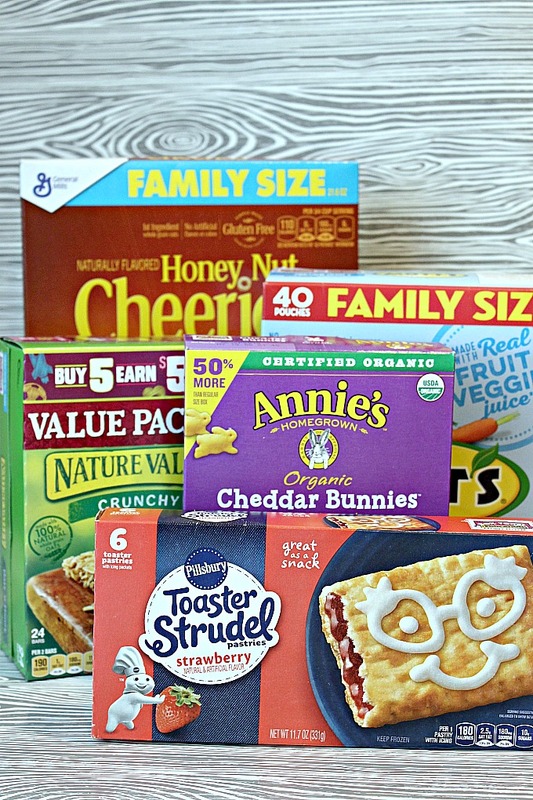 There are hundreds of products that offer Box Tops. Last year, our school earned $2479 from Box Tops alone! It makes all the cutting and trimming worth it! My son's 2nd grade teacher has a plastic baggie outside her room where students or volunteers can place their Box Tops. It does the job, but it's easy to overlook. Since I'm in there all the time, I decided to take the packaging from one of the products offering Box Tops to make a Box Top Collection Box! While shopping at Walmart, I decided to take advantage of the January Box Tops Offer. 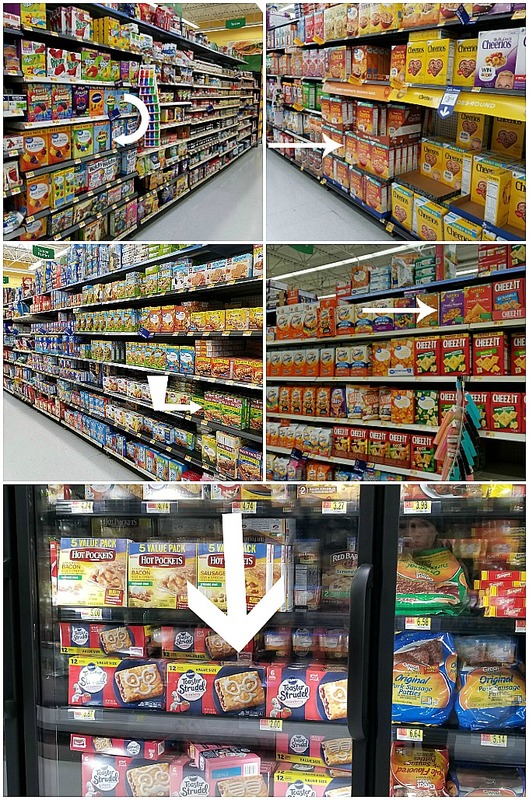 If you buy 5 participating products and scan your receipt with the Box Tops Bonus App, you earn $5 for your school (or the equivalent of 50 Box Tops!) This offer is available through 1/31/18. You can download this Box Tops Bonus app on Itunes or Google Play for your device. 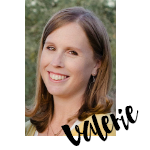 I love it because you can use the app to earn even more money for your school by simply purchasing items offering Box Tops, scanning your receipt, and watching those earnings pile up! Plus, you can earn bonus Box Tops in combination with your in-store purchase and any other coupon, discount or store program or promotion. I used my craft cutter to make this Box Top Collection Box. I love that I can purchase items I usually buy for my kids and still get rewarded for them. I don't have go out of my way to buy something nobody is going to eat. First, I removed the Box Tops panel from the Honey Nut Cheerios. Then I covered the remaining sides in white paper. I cut out the design in vinyl, using pink, white, navy blue, silver, and yellow vinyl. Layer one- navy blue outline. Once I had my design layered together, I transferred it all to the front of my box using transfer tape. It turned out amazing! I'm not going to lie- it was a bit of work, but now my son's teacher has something eye-catching so everyone will remember to turn in their Box Tops as they come into the classroom! Do you collect Box Tops? 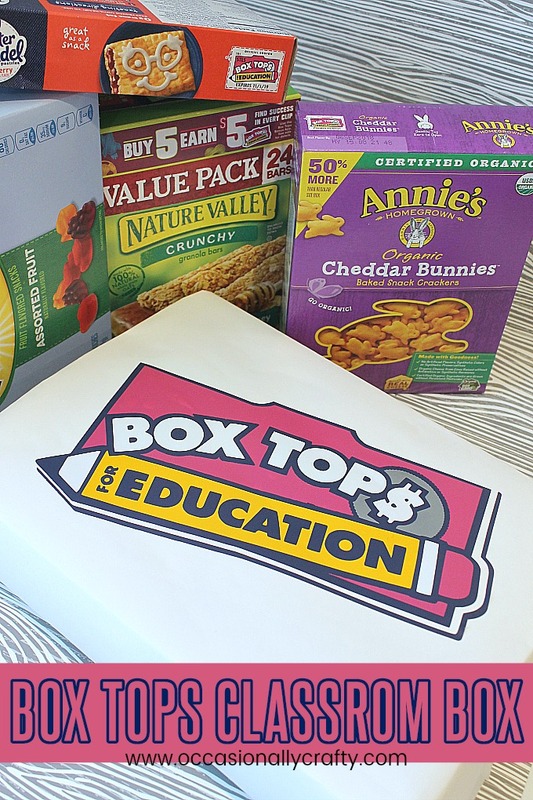 What's your favorite product to buy that earns Box Tops for your school? 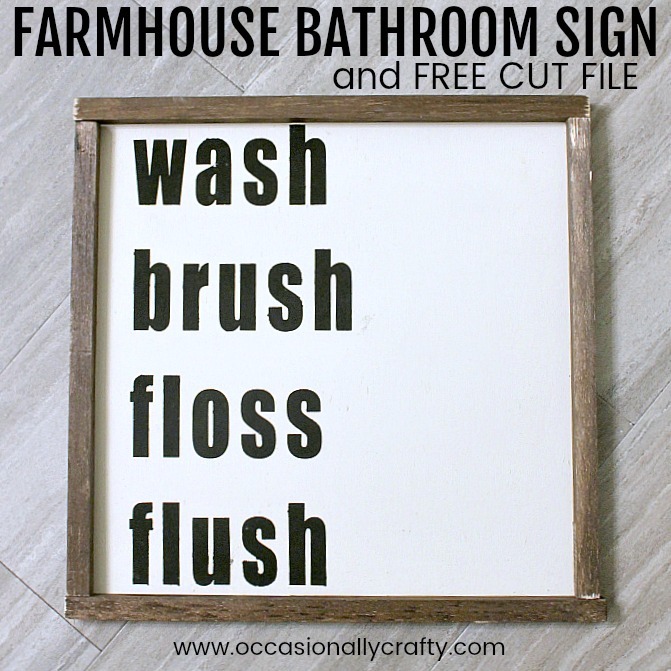 Farmhouse Bathroom Sign + Free Cut File! 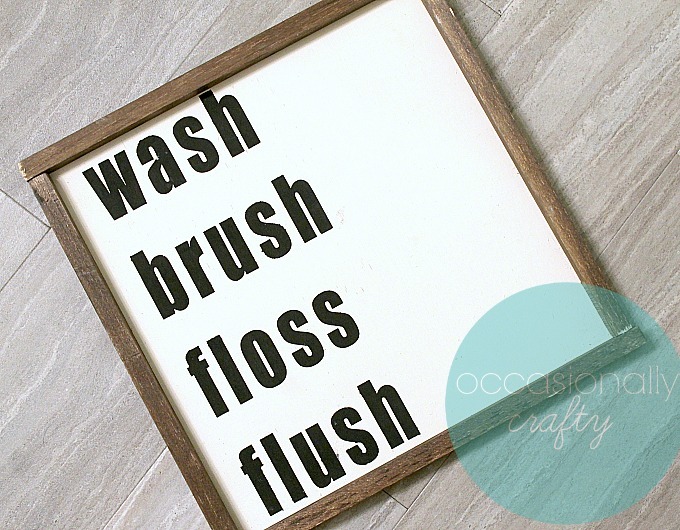 This farmhouse-style wooden sign is perfect for your bathroom! 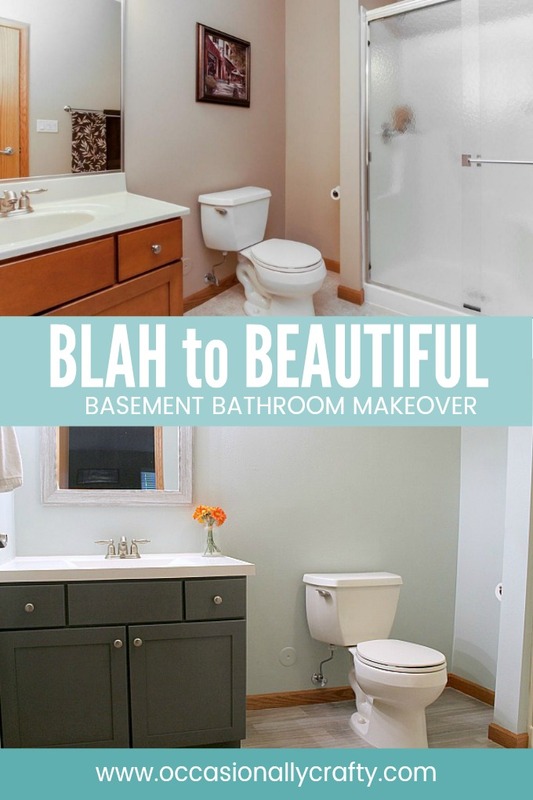 Earlier this week I showed you our basement bathroom makeover. While I still have some decorating to do, I did get this farmhouse-style bathroom sign finished and wanted to share it with you. Unfortunately, I made this sign while I wasn't blogging last year, so I don't have any process pictures. So I'll do my best to explain how I made it. It's really pretty easy. 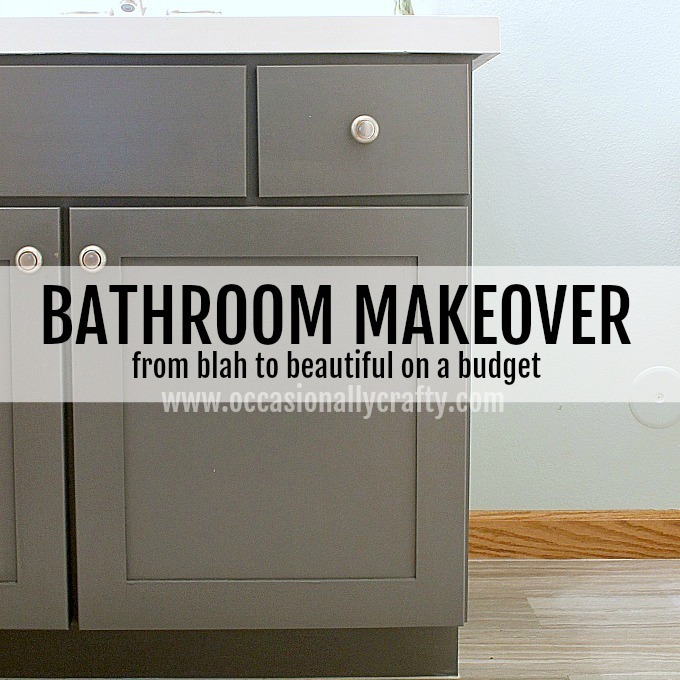 Take a bathroom from blah to beautiful on a budget! In case you are new here or just forgot, we moved from Phoenix to Iowa about a year and a half ago. We love our home, but it was definitely all "real estate beige" when we moved in. I've been slowly working on adding some character to each area of our new home. 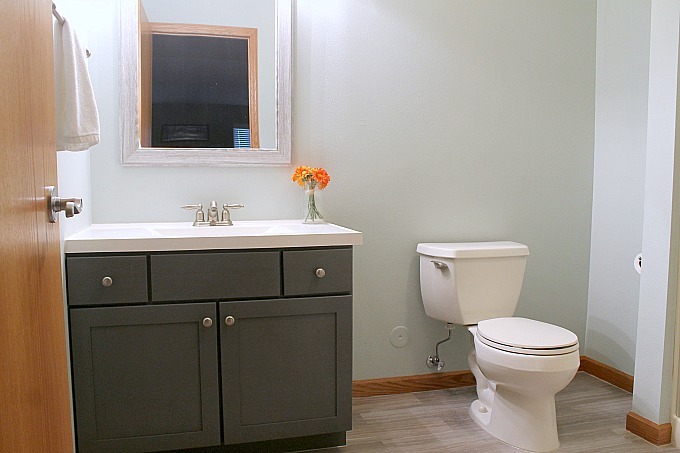 All we needed was a little paint, new flooring, and a new vanity top to make this bathroom look brand new! Because I'm on a budget, making major changes to the bathroom was out of the picture. Tip- paint is fairly inexpensive and completely changes a room! Plus, it's easy to change down the road if you need to. I painted the walls my new favorite color: Sherwin Williams Sea Salt. 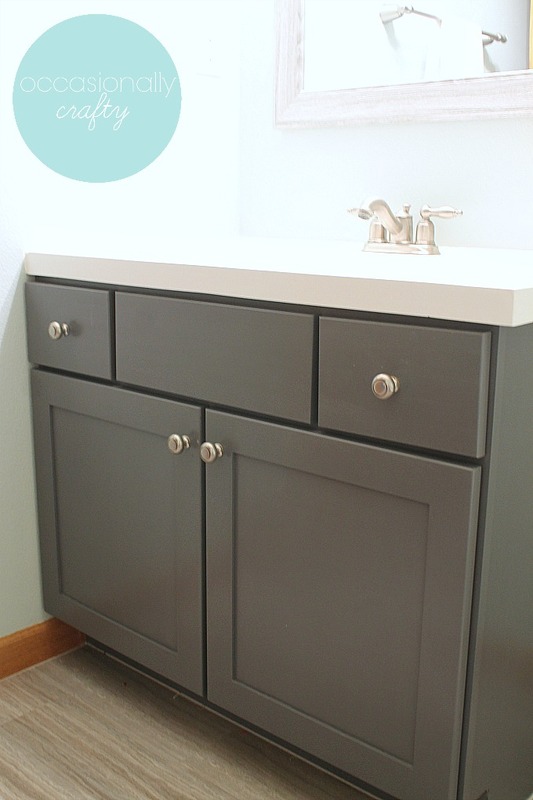 I used General Finishes Milk Paint in Driftwood to update the vanity. 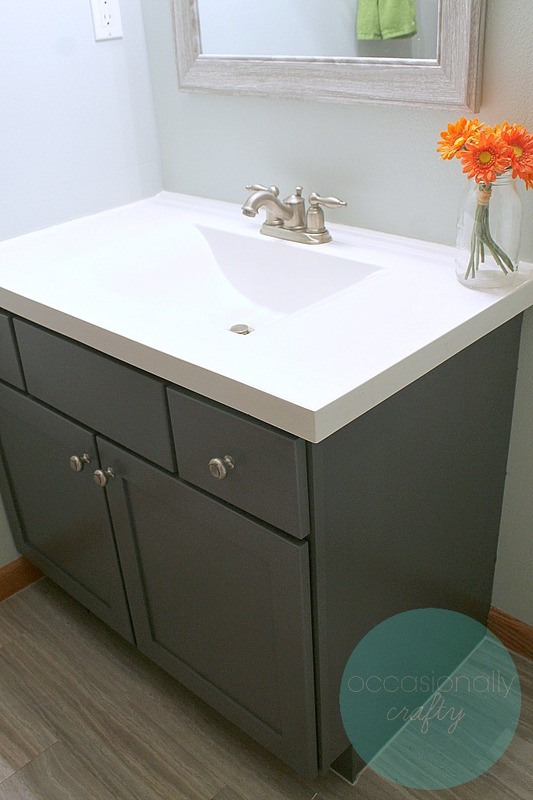 Then we also installed a new, more modern vanity top. We picked out some 12x24 adhesive laminate flooring. It's literally just trim to size, peel, and stick. 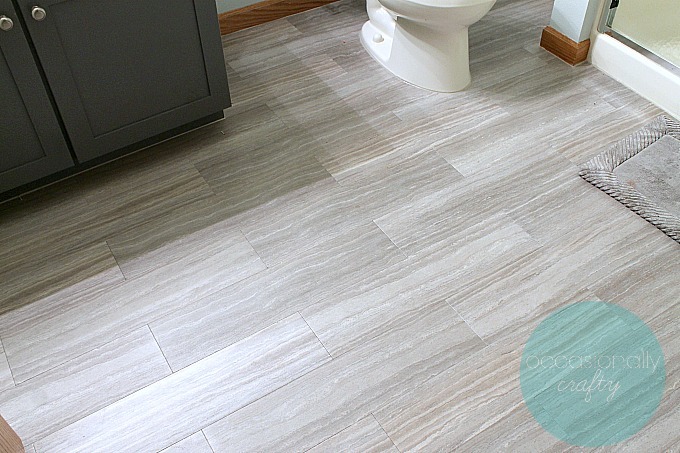 Having an updated floor makes a huge difference in how this room looks! 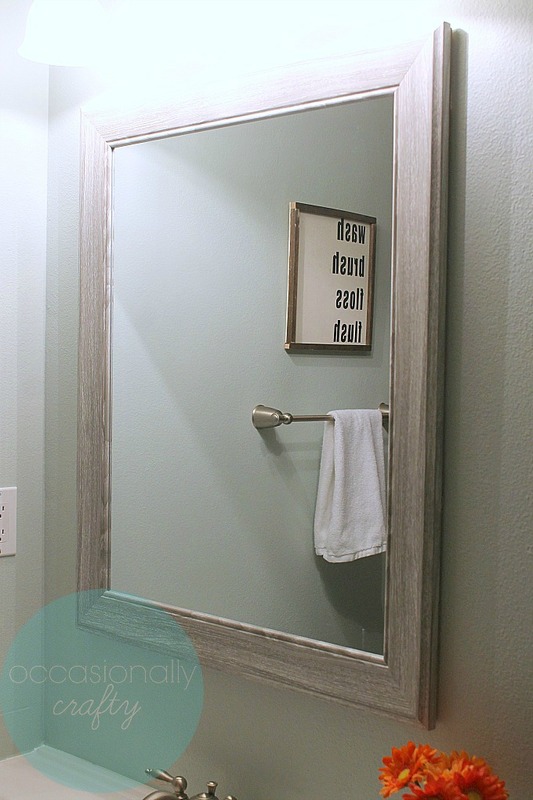 We also replaced the builder's grade mirror with something a little more stylish. I found this one at HomeGoods for about $20. Not a bad deal! I use white towels for my guests since they are easy to bleach and keep clean. And see that cute sign in the mirror? I've got a tutorial coming up for it later this week.